Have the kids long grown out of that lovely expanse of flat lawn that you are still, forever manicuring? Tired of spending the weekend pruning trees and servicing the lawn mower? Have you ever thought that your backyard should be working for you instead of the other way around? If so, the flip home series might just be the answer for you. Almost 70% of new demand for housing is for one and two bedroom households, yet more than 70% of newly-built houses are 4 bedrooms or more. 1-2 bedroom homes are hot at both ends of the market: from first home buyers wanting to get on the property ladder, to empty-nesters wanting to downsize into a lower-maintenance, more easily-manageable home. Increasing numbers of young people are choosing not to buy, or are delaying purchasing the larger-but-relatively-more affordable homes on the outskirts of the city in favour of renting closer to town; to work; to where everything is happening. 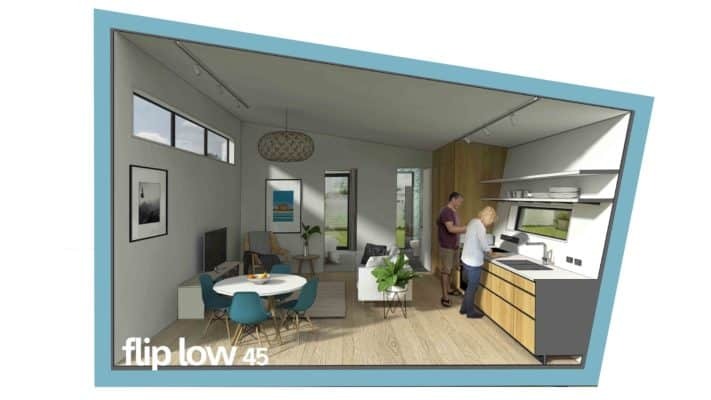 With NZ’s housing crisis not likely to be fixed any time soon, innovative, out-of-the-box housing solutions are being sought at local council and national governmental levels alike. Planning rules dictating maximum density and minimum house sizes are being relaxed, making it much easier for infill development in inner-city suburbs, and people are taking advantage of their land ownership by building, subdividing, and selling. However, subdivision isn’t the only way of getting more houses into the suburbs. PrefabNZ wanted to find an alternative and more affordable solution to housing supply, and in late 2017 set up a nationwide competition called “SNUG: a home in my backyard.” The competition used the country’s various regional district plan bylaws to allow the addition of a ‘minor dwelling’ to an existing residential property with minimal paperwork – without the need to cut your asset down the middle. In 2018, Flip was announced as one of the finalists, and subsequently won the people’s choice award. The smart, compact, architecturally-designed flip homes range from 1 bed/1 bath to 2.5 bed/1.5 bath models, within footprints 35m2 to 65m2 in area. This means they fit the housing type that’s in demand, as well as being able to fit in most backyards. Despite a diminutive footprint; space, comfort and the feeling of space is never compromised: these are stylish, light and airy dwellings whose design enables a high degree of privacy between the property’s main house and its backyard ‘neighbour’. At 45m² and 65m², the single-storied flip Low models provide fully accessible one and two bedroom houses respectively, complete with accessible wet-room bathrooms and wheelchair-friendly front decks. The flip High models, both with 35m² footprints, are designed for tight sections and/or when you want to maximise the open space in the backyard. The flip High 35 provides an entry-level, completely self-contained 1-bed, 1 bath house (no studios here) on an equally small piece of available land. In contrast, and like magic, flipping the Low’s house volume on edge creates the Flip High 65: a deceptively large and lofty two-level backyard apartment! 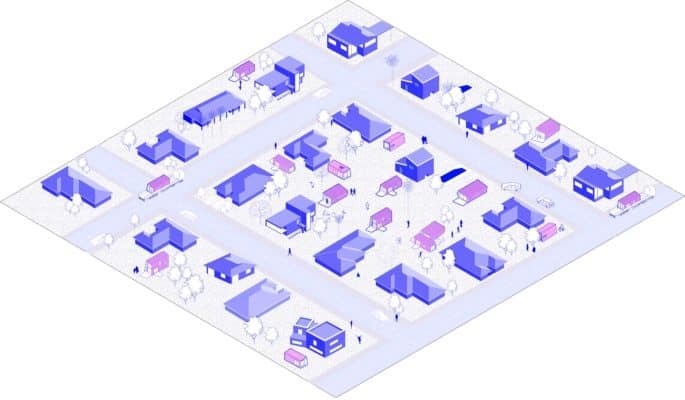 flip has been developed so that any number of home + income solutions can be achieved. Whether you want to supplement your mortgage payments on your existing house with a backyard rental or Air BnB side business; give the kids a starter ‘nest’ of their own; or stay in the neighbourhood and downsize in luxury (while retaining your existing house for passive income)… if you can dream it, you can achieve it! And with their innovative construction, it really is that easy – flip houses come to site fully-constructed and are lifted into place by a crane. Not only that – if you change your mind in the future, the house can be removed by that same crane, just as quickly and easily as it arrived! So cast out that dodgy weed whacker! Your backyard will no longer demand sweaty weekend maintenance – it’ll be serving you up a cold beverage in the sun, complete with the company. Check out Flip house to see how Flipping your back yard could work for you – and the other SNUG competition winners. Alternatively, If you are looking to buy or sell a property, Tommy’s salespeople are equipped to give you the best advice for all your property needs.